Gary Fairhurst is a Massage Therapist and has been practicing for over 12 years in both the United Kingdom and Australia. He holds diplomas in Sports Therapy and Sport Injury Massage and also has a certificate in advanced Remedial Massage. 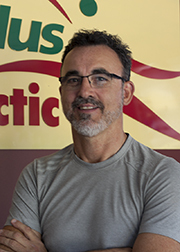 Gary’s preferred massage style is deep tissue work and sports injuries. He is a professional member of AAMT (Australian Association of Massage Therapists). Gary also runs a very successful corporate massage business and is the official massage therapist for the Sun Herald City to Surf. Outside of massage his love is football, especially Liverpool FC. Gary is married and has two beautiful daughters, who both share his passion for football.